One New Aftermarket Replacement CV Driveline Assembly that fits Case-IH Round Baler Models: RBX441, RBX442. Ford / New Holland Round Baler Models: BR7060, BR740, BR740A. CV (Constant Velocity) Driveline Assembly. 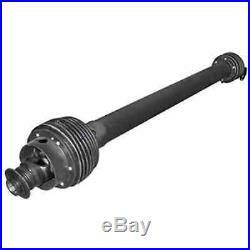 This is a complete driveline replacement, components from the original will not interchange. Size: 4 SFT CV free rotation w/shear bolt clutch. Tractor: 1-3/8 – 6 QD Collar. Implement: 1-3/8 -21 Tapered Pin Shear Bolt. Length: 51 Center to Center On U-Joints. (1) Rilsan Coated Inner Tube (87517781). (1) CV Center Body (87517785). (2) Cross & Bearing Kit (Extended Lube CV) (87517787). (1) Tractor Yoke, Splined 1 3/8 – 6 Spline w/ Ball Collar, CV (87518490). (1) Cross & Bearing Kit (Extended Lube) (87520078). (1) CV Free Rotation Outer Tube (87520085). (1) Complete Shield Kit (87643118). Replaces Part Number: DRF30-0040 , 9600269, 86604844, 87516686. Our processing system is automated. Thank you for your continued patronage. We carry parts for Engines, Transmissions, Front & Rear Axles, Hitch & Drawbars, Undercarriages, Final Drives, Seats, Bearings, Cups, Cones, Seals, Discs, Couplers, Gears, Brakes, Pressure Plates, Pilot & Throw Out Bearings, Ring & Pinions, Gaskets, Decals and MORE for most high wear items. We also carry replacement parts for the Boom Cylinder (Seal Kits, Tubes, Glands, Pistons, Rods). The item “PTO Driveline For New Holland Case IH Baler BR740 BR7060 BR740A RBX441 RBX442″ is in sale since Monday, January 05, 2015. This item is in the category “Business & Industrial\Heavy Equipment Parts & Accs\Tractor Parts”. The seller is “reliableaftermarketpartsinc” and is located in Williamston, Michigan. This item can be shipped worldwide.